As I began my adventures as a foodie, I kept coming across the term crème fraîche. I had no idea what it was, but I found several references that described it as something like yogurt or sour cream. I made a few dishes with those ingredients as substitutions and they were pretty good. I realized, though, that I didn't really know if they were good substitutions or not. I'd never had any crème fraîche. I'd never even seen it in the supermarket. I did find one video about how to make it, from a chef I'd never heard of, but it's only been recently that I decided to give it a go. Now that I've made a few batches, I can report that crème fraîche is wonderfully tangy and creamy. Yoghurt or sour cream just don't do it justice. And it's ridiculously simple to make. There's not a lot of reason to substitute anything. I've fallen in love with it as a homemade ingredient. For those who don't know, crème fraîche is cultured cream. I don't mean that it's been to the opera or can discuss the finer points of a James Joyce novel. In the food world, “cultured” means it's laden with “good” bacteria. 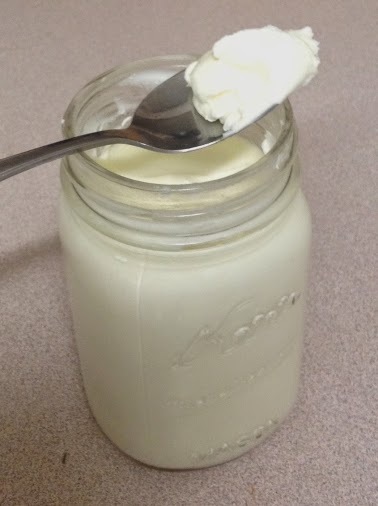 In the days of yore, when it was still easy to get unpasteurized dairy products, all you would do is put some cream out in a warm place overnight and let the natural bacteria in the air and cream do it's work. These days, buying unpasteurized dairy products requires you to sign a release form, if you can legally get it at all. To make cultured cream, we have to bring the bacteria back. The easiest way is to invite buttermilk to the party. The other issue is temperature. The bacteria will thrive best in a warm environment, but not too warm. About 75 ºF is what we're after. My kitchen gets too cold in the winter so, I turn on the light in my oven and let it sit in there. It keeps the temperature just about perfect. Colder temperatures can work, but it will take longer. Another concern, when making any ingredient that you might otherwise buy at the supermarket, is cost effectiveness. In this case, the cost of the ingredients was about $2.72 for one batch, not counting my time and the electricity to power the oven light. I can't buy crème fraîche at my local supermarket. The cheapest online source was I found was about $7.35 for the same amount, not counting shipping. That's a savings of $4.63 per pint. That's about 170% less than “store bought.” Not bad. It's not as cheap as substituting yogurt or sour cream, but like I said, they're just not the same. In my mind, it's well worth it to make your own. Mix the cream and buttermilk together in the pint jar. Cover with two or three layers of plastic wrap and seal with a canning ring or rubber band. Poke three or four small holes in the top of the wrap so the cream mixture can “breathe.” Put jar in a warm place, about 75 ºF, for 12 to 24 hours. The mixture will become thick, but can still be poured, the longer you leave it, the thicker it will get. Stir the mixture, replace the plastic wrap, or get a lid that will seal. The crème fraîche will keep in the refrigerator for about one month.